Recently the CMP adopted new rules that allow the use of magnified optics, up to 4.5X power, in Service Rifle competition. The Nightforce NXS 1-4x24mm Compact Riflescope, while not designed specifically for Service Rifle competition, complies fully with the new Service Rifle optics rules and works very well. In fact, our correspondent Johnny Fisher used this scope to take third place in the recent California State Service Rifle Championship. Here’s a run down of the scope’s features and performance. Johnny says this is a “great scope” and “results are extremely promising” so far. 2016 has brought with it a long anticipated rule change that allows for the use of optics in Service Rifle competition. The rule allows scopes (fixed or variable) up to 4.5 power with an objective lens no greater than 34mm. Given the strict limits on max magnification and objective size for Service Rifle optics, there are somewhat limited options on the market at this time. Service Rifle competitors are now challenged with selecting an optic that fits the rules while offering high-end performance. Thus far, it seems the biggest concerns that Service Rifle shooters have when considering an optic are: quality, repeatability, parallax, reticle choices, and durability. Click Image for Full-screen Version. The vast majority of Service Rifle Rule-compliant scopes currently on the market have a fixed parallax. That means there is no separate focus knob to adjust parallax to target distance. Accordingly, there has been much concern about the potential for parallax error over the three different distances in Across-The-Course competition. 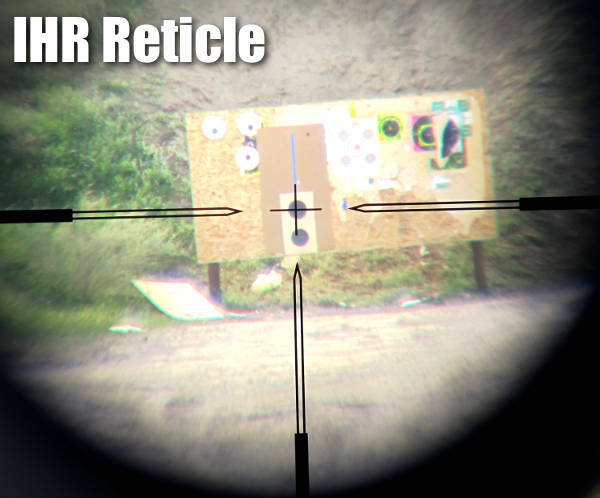 It is possible that the repeatably-indexed head position maintained while shooting a Service Rifle, along with a little extra emphasis on sight alignment to ensure that the shooter’s eye is directly behind the scope, can greatly mitigate the potential effects of parallax error. The Nightforce NXS 1-4x24mm comes with the parallax factory-set at 75 yards. Combined with the right amount of eye-relief and low-enough rings to ensure an easy-to-maintain and clear/full sight picture, it seems like the fixed parallax is not really the problem some folks think it may be. 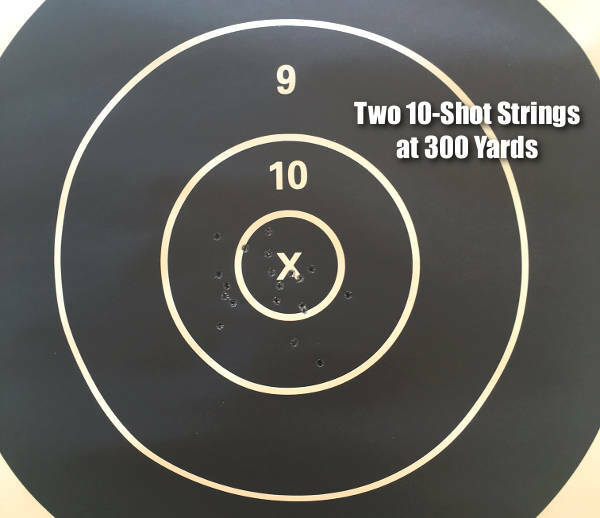 Below are two, 10-round test strings shot at 300 yards (each with a magazine change). Note that I didn’t drop a point, even with the non-adjustable parallax. The Fixed Parallax is not a “deal-breaker”. Witness 20 shots at 300 yards — all 10s or Xs. For the NXS 1-4x24mm scope, Nightforce offers two reticle types: the International Hunting Reticle (IHR) and the FC-3G (with 5.56 NATO or .308 NATO BDC hold-over features). My scope has the IHR Reticle, which provides a very clear, unobstructed and simple sight picture. The IHR reticle for the NXS 1-4x24mm boasts an illuminated center cross-hair. Unfortunately, the red-color illumination is really only intended for low-light situations and is not bright enough to offer any aid to National Match shooters competing in broad daylight at stationary targets. For Service Rifle shooters accustomed to keeping track of their sight settings as “clicks from bottom”, the optional Zero-Stop might be welcome. After loosening the turret and establishing the desired Zero-stop location, tightening the set screw blocks rotation below this point. NOTE: Once set, the Zero-Stop turret only allows for one full revolution of elevation adjustment. However, the Nightforce NXS 1-4x24mm offers 20 minutes of elevation adjustment per revolution. That should be more than enough elevation adjustment for come-ups to 600 yards (even with a 100-yard zero established near bottom). The Nightforce NXS 1-4x24mm carries a price tag of just over $1500.00. The scope just feels solid –nothing plastic — especially when compared to some of the other consumer- or recreational-grade options on the market. All touchable tolerances feel extremely tight. There was quite an amount of attention given to every little detail, as you would expect from an optic at this price point. It is hoped that the scope’s mil-spec robustness will assure continued excellent performance — even after seasons of the kind of abuse that High Power shooters put on their equipment. More will be revealed as I use the scope at future competitions, but initial results are very good. This is a quality optic. I have high hopes that it will prove a good investment. For more info and product specs, visit the Nightforce NXS 1-4x24mm Compact Riflescope webpage. Share the post "Service Rifle Optic Option — Nightforce NXS 1-4x24mm"